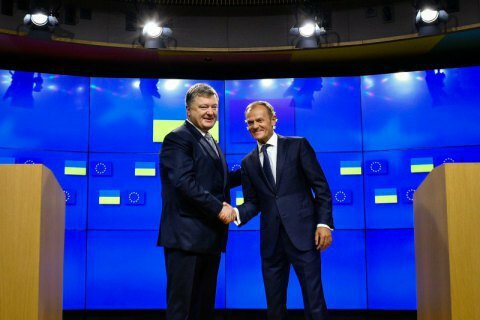 The agreement on the association of Ukraine with the European Union will begin working in full as early as 1 September this year, Petro Poroshenko told reporters after a meeting with the head of the European Council Donald Tusk.
" It is very important that the EU leaders have done their best for the entry into force and completion of ratification of the Ukraine-EU Association Agreement to finally happen. It takes place exactly today and on September 1, the Association Agreement will enter into full force," Poroshenko said. He also noted that now Ukraine is working to carry out reforms to catch up with the those countries that "bid farewell to the USSR earlier." "These are historic days for Ukraine, when after the visa-free regime we say the 'last goodbye' to the Soviet Union and the Russian Empire. Poland, the Baltic countries, other countries of Eastern Europe did it 20–25 years ago and we are doing our best to implement reforms," the president emphasized. Tusk, in turn, highly appreciated the efforts that Ukraine made to realize pro-European aspirations. "Thank you for your pro-European determination and the courage with which you defend your independence. For all of your successes you had to pay with hard work and, unfortunately, blood. You deserve everything you have achieved, which is why so many of us here in Europe admire you and support you," Tusk added. Poroshenko thanked the head of the European Council for hospitality and expressed hopes for the continuation of fruitful negotiations during the 19th Ukraine-EU summit in Kyiv on 12–13 July. On 30 May, the Netherlands, the last of the EU countries, ratified the Association Agreement between Ukraine and the EU. European Union expressed expectations that the AA will enter into force in full on 1 September. The Association Agreement has operated on a temporary basis since 2014.